Just like The RevealTM, The ForteTM is a well-rounded cable designed to bring out the best in your instrument, especially the lows. The dual IGL-ECSTM conductors minimizes the effects of strand interaction, the largest source of distortion in cables, yet retains flexibility of a common stranded cable. High purity copper provides open and extended midrange and high frequencies without artificial etching or glare. Parallel conductor geometry minimizes strand interaction compared with braided shields. Cotton insulation wraps the conductor with a lower dielectric constant than polymers, to preserve micro-dynamics and resolution of detail. The carbon skin extruded over the primary lead reduces triboelectric noise. Low capacitance allows the cable to be used in long runs without high-frequency roll-off. Silent Plug Information The ForteTM Instrument Cable with Optional Neutrik Silent Plug for the same price as a regular cable. The ForteTM needs no introduction, the silent plug does. If you switch guitars often in a gig, The ForteTM with a Neutrik Silent Plug is the instrument cable for you. The plug will automatically short (mute) when you disconnect from a guitar. 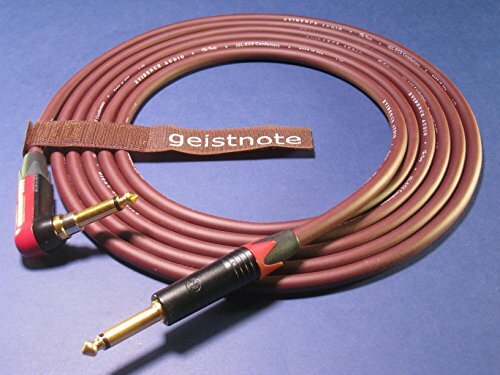 This will save your amp, you ears, and make the sound guy happy. Don't worry about muting everything. Just pull the plug. The silent plug is for use with instrument (guitar) applications only. Damage may occur if connected to an amplifier. Please note that the signal isn't muted with some types of active electric guitars which are equipped with tip-ring-sleeve jacks that tap to activate the guitar power supply. The silent plug itself is not covered in our warranty because it does have a lifetime of 10,000 mating cycles. We will replace the silent plug for the cost of the plug. Cardas Quad or Tri (RoHS). If you live in a country requiring RoHS compliance, TRI solder will apply. If you have any questions about this product by Evidence Audio, contact us by completing and submitting the form below. If you are looking for a specif part number, please include it with your message.